I was hoping to see it on Halloween event sale. Another week, another 'No Wedding Dress Outfit'. Put it back, please. Wallet stays locked until it is added. Runecrafter's kit is a scam! just salvage rune/sigil to dust. i want my 200g back. Can the Mask of the Wanderer skin come back to the store? Seafarer's Rest (SFR) since launch! Well of course they're bound to show up again eventually, and any items that show up again within any sort of close proximity to any post in this thread is purely coincidence. I guarantee that nothing posted in this thread has any bearing whatsoever on what shows up in the shop when, which is why I've given up. The things I've been waiting for will show up again eventually, and until then, they just won't make any money off of my account...and I know they don't care. There is usually New Year/ January discounts on the expansions? I want PoF but it's a little expansive for me. not really sure on the name, but the idea being that it could be a Novelty/Combat Tonic you can set to the appearance of one of the characters on your account, then, on other characters, use the tonic to look like the preset you chose. I can see this not being a thing because of character slots, total makeover kits, etc, but with the inability to change race/class, people may like to make a character to play the alternate races' storylines, and maybe even grew attached to the character, and maybe just want to LOOK like their Main or something, while still keeping the other character's progress.. i can also see it being an issue with maybe taxing the server by making it recall 2 appearances from an account at the same time, or possibly an issue with saving the appearance or something... not really sure about what kind of impact it would have, since in my head it would just be interacting with the same account it was already interacting with to begin with.. i suppose to limit this, it could have a cooldown on saving a preset. but it would basically work just like any Combat tonic, changing the base appearance and armor to the saved appearance, with the weapons being whatever was already equipped. voices could change with the tonic to match the race/gender of whatever they change into, though not influence dialogue and story, obviously.. this could also be a fun way to allow someone to wear heavy armor as a light armor class, simply by making a clone of their Main in an alternate armor class. and since all races and genders already have the ability to wield each weapon just fine, there wouldnt be any animation issues. * Armor/Outfit that gives the feel of a scoundrel. Something like Han Solo's clothes. Make it look good on male human characters pretty please! Jungle Explorer outfit and Outlaw Outfit really make them look strange with thick thighs and small/narrow shoulders. 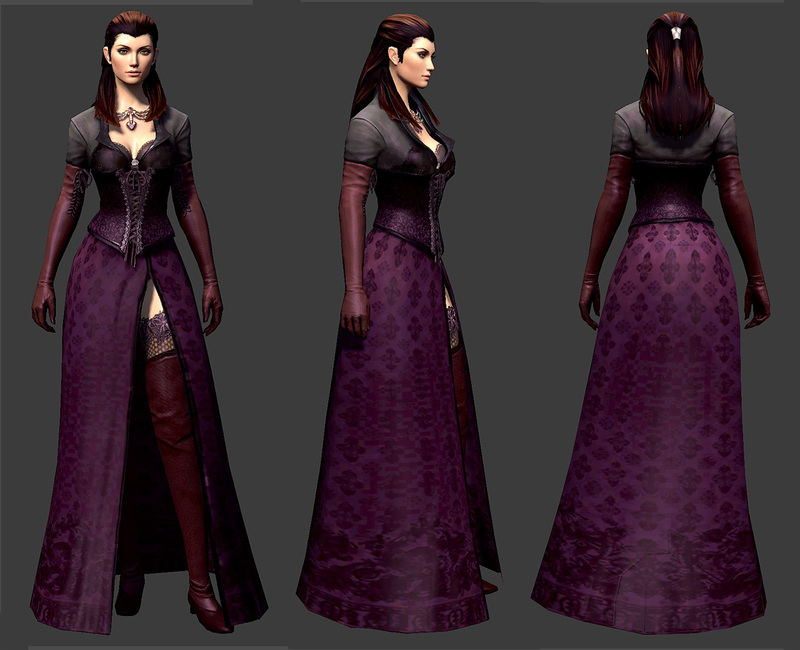 I really, really, really want to see some clothes like that in-game, without the cloaks around waist or trousers. A bandana hanging around neck and on back would be ok though! Can we please get something like this in the future ANet? I love Zafirah's Outfit so much, but I wish I could change some pieces of it, like the top and the sleeves/cloak on it. I really love how trousers and boots are done on that outfit and I'd love to see more of such sets/outfits in game, using the theme I proposed above. ...but it is Light Armor. Medium armor is nothing close to it and doesn't fit my Thief's theme at all I was so excited to see that light Elegy armor, but then got so super disappointed to know it's light armor. This sounds like a random request but id love to see some kind of gem store item that changes the hue of abilities in PVE (not PVP or WVW for obvious reasons). I bought the Chain Sword skin for my mesmer many years ago and i love the green but it looks a little odd with his purple abilities. Valentines Day is coming up, and I really want the backpack version of the Valentines Day Glider. I'd even fork over a few more bucks for it. I still would like to be able to purchase songs to automatically play on our musical instruments. Individual songs or packs of songs. For those of us who aren't enthused with looking up macros. I'd love to see to be able to get the chance to buy the Phalanx heavy armor set outfit. I just like the way it looks, and missed the chances to buy it previously. I'd like to request making the armor that Zaishen Zealots wear into wearable player armor or even an outfit. I would like to request the First Follower Desmina outfit to be returned to the gem shop please. Please bring back the Largos backpack glider combo! Make the phalanx heavy armor skins available please. Phalanx heavy armor skins! Please!!! I would like to buy the Phalanx Heavy Armor Set too. Add my name to the pile for the Phalanx set. Also, will you bring back the Reading Glasses? It's 2019 and I'm pretty sure this has been brought up a lot but I would prefer spending gems on armor sets than outfits. So, please, more armor sets instead???? Can we please get Crystal Savant and/or Elonian Elementalist sets for sale? At least one of the two, I'd really love to have them both but any one of them would be great. Thank you! Also, as I saw the first comment on this thread my heart literally skipped. Memory of Lion's Arch Pass is such a great idea, it used to be my absolute favorite zone in all of gaming ever, the old LA. When I took a break for a year (from LW1 episode 3 to around HoT) I logged back in... and I saw the devastation. I was crying at my desk, I just couldn't accept what happened to our beautiful city. I wandered aimlessly around it until I ran into survivors right outside in Gendarran fields who told me that most people lived and are taking refuge at Vigil keep. I ran over there as fast as I could, just to make sure everyone was alright... and then I logged out and didn't come back for 3 years. I just couldn't bring myself to play GW2 without Lion's Arch. My heart was broken. I... really, really dislike new LA. Old Lion's Arch had so much character, so much individuality. So much flavor. New LA is just a Sea World. Whenever I go through the original story and I have missions in old Lion's Arch I can't bring myself to leave the instance for hours. If there would be a Memory of Lion's Arch pass I'd pay double, triple of what I paid for my Mistlock Sanctuary passkey. Please take my money Anet. I just want to stay in Lion's Arch Memory forever. GIVE US NEW AND AMAZING HAIRSTYLES AND FACES. EDIT: omg nice, it IS on discount!!! Not sure where to make a request like this but please please please can we have the Fire-Breathing package with the Fire-Breathing Quiver and longbow back? Please? Pretty please? This is not a suggestion for a new or returning item specifically but more of a suggestion in functionality/feature. This suggestion is both QOL and Gem Store related, so I will be posting on both threads. It would be awesome if when sending a gem purchased gift, if there was an option on the item that would allow you to accept the gem equivalent for your account rather than the item itself. This would (possibly) increase the amount of gifts sent via the gem store. I know I try to only send to one person for whom I have api keys so I know if I am sending something he already has. I also had a situation where I received a gift of mount licenses and had already unlocked all of the ones for that set. The person who sent the gift and I both had to put in a support ticket to get the original gem purchase revoked, and this could cut down on those types of tickets. As the gift is mailed immediately, I would think you wouldn't have to worry about someone purchasing at a lower price and then trying to get gems after that item discount has ended. Or, include in the option of accept the gift or accept the equivalent XXXX gems for your account. The new greatsword skin within bl chests is amazing why not making a whole set of bl weapons in that style for bl tickets? Could you potentially make angel wings that look like "Hawk Wings Backpack"? I feel like their proportions are more proper, and it looks less like a feather cape and more like actual wings. Thanks. Third garden plot or SOMETHING in that spot, it's driving me crazy. Yay, finally the Sworn Zaishen Helm Skin returned in the Special Items category. Thank you! Oh that's right, like I said before, they don't look at this thread, and they don't care what we want. I'm on the verge of quitting again because I can't give my character the look that I want, and therefore don't feel like playing. Hello, it would be very useful to expand the maximum stacks in bank in the same time whey we buy the expand for the Account vault. For example i have 1500 max stack in Account vault but still have 250 max in bank. It should be useful to have same amount available in both with the same expand purchase. Someone may have suggested these things in here at some point, but here we go anyway. While not technically gemstore items, but sort of since you need a style kit, I would love some new tattoo options for Norns - I feel like the ladies kind of got cheated out of some cool knotwork tattoos, the dudes have way more options there. Also in the same vein, having new skin patterns for charr, sylvari, asura, or new skin color/pattern color/glow color would be great additions to style kits. I know some people don't want more mount skins, but I would personally love some sylvari/sylvan themed ones, mostly because I'm biased and Sylvari are my favorite and it would be pretty sweet if they could have matching mounts Actually kind of surprised they haven't been made. I'd like to see the return of the Reading Glasses, they are on my "instant purchase" list alongside the Wreath of Cooperation. A mini ley-line that would use the same animations as the mystic dragon. A full base mounts dye kit (I suggest 1600 gems, including the roller beetle and the glider) that would give us 4 dye channels to all of our mounts, reusing the base model's colour paterns, as well as a second dye channel to our base glider skin to bring it on par with the others gliders. Suggestion: Make a matching Roller Beetle skin for all mount packs. It would cost something like 400 gems and would be sold separately, but would only be avalaible if we already purchased the matching mount pack. They shouldn't be tied to any limitted-time sales so people can complete their sets anytime. Guild Slot Expansions, I know of several players will full guild slots that would purchase this item to be able to join more than 5 guilds. Put them in for 800gems. Also I'd really love to see Caithe's new look from when she gets all crystallized from Aurene be introduced either as an outfit or for sylvari to use, it was so pretty. Dear A-Net Dev Team... Pretty Please with cherry on top... I would LOVE to have a PAIR OF ICE SKATES!! Thank you for your continuous hard work!! Can we have this outfit please? ! Are additional character slots ever on sale? I'd grab a few for sure, current limit is a bit tight. They do go on sale, recently grabbed a couple at 600 gems.